Government Commissioner Dr. Attila Aszódi in charge of the enlargement of the Paks Nuclear Power Plant on February 24 presented information to the IAEA leadership regarding the state of the PAKS II. development project, and recommended that a round-table discussion be organized between IAEA senior officers and the important Hungarian decision-makers dealing with the PAKS development project. All stakeholders praised the program, which aimed at better involving IAEA’s experience in carrying out the PAKS project, and strengthening its international transparency. The IAEA leadership gave special attention to the benefits of receiving an INIR (Integrated Nuclear Infrastructure Review) mission in Hungary. 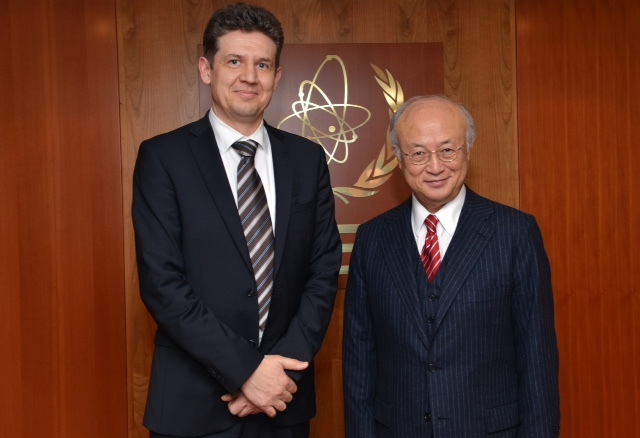 IAEA Deputy Director General Chudakov indicated the possibility of continuing the discussions regarding the Practical Arrangements of the joint IAEA-NFM nuclear education program, which were initiated last year.